Free sweets, dressing up, and getting scared out of your wits - no wonder kids love Halloween. And with the half term weekend falling on this spooktacular holiday, there are loads of activities to get up to. Between 3pm-4.30pm on the 31st October, Whitehall museum will be telling spooky stories in the attic, making scary spiders, and searching for treats with the aid of some creepy clues. £4 and suitable for 4-11 year olds. A whole week's line up of activities are going on over the half term at Heritage Farm Nurseries. There will be some creepy encounters in the tropical aquatic shop, Halloween themed activity packs, and a trick or treat lunch (think Bertie Box Every Flavour Beans). If you show up in fancy dress, then you'll get a free gift. 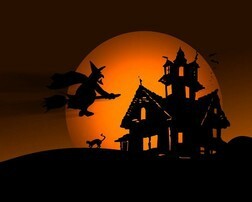 A ghostly tour on the 28th October is sure to give you a fright. As the guide walks you round the park, he will tell some spooky stories. Tour times are 5pm, 6pm, and 7pm, increasing in spookiness with each passing hour. Tickets are £5. Between the 27th October and 4th November, Bocketts Farm will be hosting Witches and Wizards Week. There will be a chance to milk the goats, watch pig races, have pony and tractor rides, see the reptile roadshow, do arts & craft, and experience a witch trial. The Arc Caterham are bringing Halloween to the realm of soft play. On Tuesday and Thursday of the half term week, Vincent the Vampire will pay a visit to the soft play area. He will be there at 11am and 2pm running quizzes and colouring competitions. There will also be a quiz night for adults on the 1st November for £10 at 7.30pm. On the 2nd of November there will be a Live Action Horror Maze. It lasts between 7.30pm-9.30pm and is suitable for anyone over 6. Tickets are £7.50 or £25 for families, and must be pre-booked. Finally, on the 3rd November at 7pm, The Arc will be playing Shakespeare's Tragedy, Troilus And Cressida. Tickets are £8. Voted the number one Halloween family attraction, Tulley's Farm Spooktacular is holding thirteen days of fun and games. You can take a Horrid Hayride into The Forbidden Forest, visit the Creepy Cottage, Boo Barn, and Fun House, or explore the Spooky Trail on a search for witches, ghosts, and pumpkins. You can also try your hand at pumpkin carving, watch a fireworks display, and see the Dashing Doctor and his sidekick Ad Nauseum, put on a Halloween show. See here, for dates and ticket prices. Spend your Halloween at Chessington World od Adventures and you will get to go on after-dark rides and hair-raising rollercoasters. You can also book a room at their resort hotel in one of the Halloween themed rooms.